Olympia marble-wing photographed at Illiniois Beach SP by Doug Taron. Among the charms of tall grass prairies is that their colors change throughout the growing season as one plant blooms and another recedes into senescence. The first great spectacles reach their peak in mid-May with the Krigia, cream white indigo, and bluets and go from there. Each prairie seems to have its own special times when a given element of particular abundance is in fluorescence. Unfortunately, I often miss these first displays, as May is usually a time of woods and migrant traps, where warblers and other passerines win out. 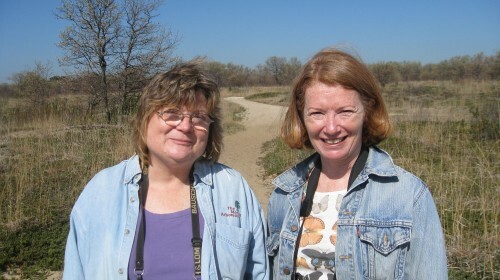 When Rita Hassert a librarian friend at the Morton Arboretum told me last year that the Council on Botanical and Horticultural Libraries was meeting in Chicago at the end of May, I offered to lead a field trip for them to Chiwaukee and Illinois Beach State Park. Illinois Beach that time of year shares the pucoons but also features the diminutive white sand cress, as well as two butterflies found locally in few other places. 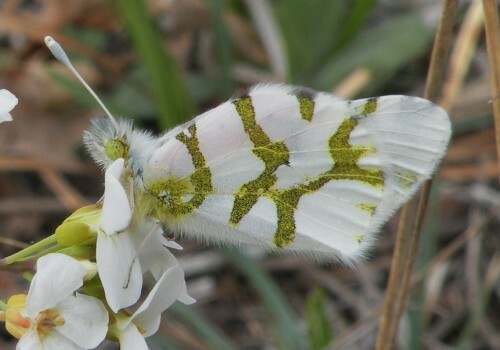 The Olympia marble-wing larvae feed on the sandcress and the inner wings of the adult sport the same white with tiny black spots of the flower. But the underwings feature an intricate marble like pattern of green and gold over white. The second butterfly is also small: the hoary elfin feeds exclusively on bearberry and is a dark little sprite that had eluded me for years. (I still think the name conjures up toddlers in pink hotpants.) Because the day was rainy there were no butterflies about but some late migrant birds were present. Only one of the librarians had binoculars but we did see a lovely blackburnian warbler and a Brewers blackbird, which is also a local rarity that is best found at Illinois Beach. Chiwaukee came through with the shooting stars and other expected floral gems. One sharp-eyed member of the group spotted a lone morel mushroom that must have been deliberately spared as it was large and somewhat out in the open. The most unusual thing we saw was a still unidentified moth that had irregular wings that looked for all the world like a shriveled up leaf. I had to see the legs before I was convinced it was not. Cindy and Deb at Illinois Beach. For the third day in a row, a prairie visit was on the agenda. 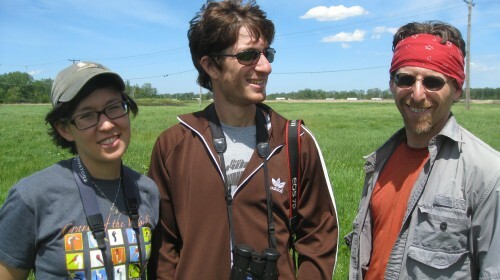 This time Josh Engel, Lizzie Condon, and I rendezvoused at Markham Prairie. Markham in May can be covered with prairie phlox and false dandelion (Krigia) in a tapestry of gold and blue. We ran into Stuart Goldman, the biologist who currently manages the prairie and he told us that the Krigia was late this year but the phlox was conspicuous. Also in full bloom were dainty bluets. There is one portion of Markham that harbors the largest population of cream white indigo (Baptisia leucophea) that I know of. 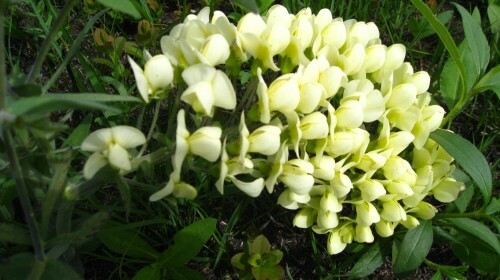 It is closely related to its much more common cousin the false white indigo (B. leucantha) except that it is recumbent and the flowers are the color of rich cream. 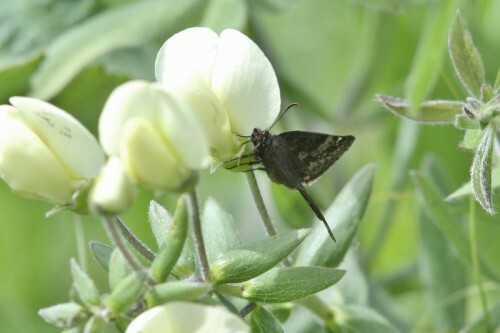 Josh managed to not only get great photos of the plant, but on one flower cluster he captured the image of the aptly situated wild indigo moth. Cream white indigo at Markham Prairie, spirng 2011. While I can get lost in the world of prairie plants to the exclusion of birds, Josh and Lizzie are there to bring me back. Markham usually offers a nice selection of grassland species. An eastern kingbird and eastern meadowlark perched conspicuously and a grasshopper sparrow sang from a patch of big bluestem. 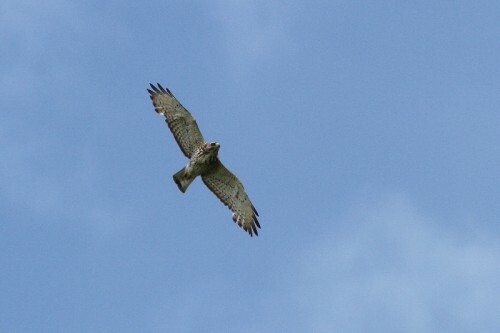 Then Josh spotted a buteo soaring over that proved to be a broad-winged hawk, my first of the year. Lizzie, Josh, and Stuart at Markham Prairie.